Book Spotlight: "Embraced By God"
Many women not only struggle to understand who they are, they struggle to believe whose they are. As daughters of the King, they are not just precious but deeply loved. 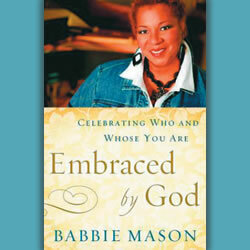 In her new book Embraced By God: Celebrating Who and Whose You Are (Abingdon Press), gospel artist Babbie Mason shares her personal journey to understanding how very much God loved her, not as a singer or teacher, but as His child. Here she equips readers to accept that love and grow their confidence because of it.